Much to the delight of NASA/JPL's Mars Science Lab team, the laser instrument has fired nearly 500 shots so far that have produced strong, clear data about the composition of the Martian surface. "The spectrum we have received back from Curiosity is as good as anything we looked at on Earth," said Los Alamos National Laboratory planetary scientist Roger Wiens, Principal Investigator of the ChemCam Team. The MSL science team plans next to take the rover out for a short spin to test out other systems. As the mission progresses, researchers will study the Martian environment in the vicinity of Mount Sharp, a towering peak with a summit nearly three miles above the rover. Mount Sharp appears to contain layers of sedimentary history dating back several billion years. These layers are like pages of a book that could teach researchers much about the geological history of the planet, including whether the Martian environment ever was, or ever may be, suitable for life as we know it. "When ChemCam fires its extremely powerful laser pulse, it briefly focuses the energy of a million light bulbs onto an area the size of a pinhead. The laser blast vaporizes a small amount of its target up to seven meters (23 feet) away. The resultant flash of glowing plasma is viewed by the system's 4.3-inch aperture telescope, which sends the light down an optical fiber to a spectrometer located in the body of the rover. There, the colors of light from the flash are recorded and then sent to Earth, enabling scientists to determine the elemental composition of the vaporized material. Scientists tested the system on Earth in a chamber that simulated the Martian atmosphere. Some of the initial spectral data from Mars look similar to some of the terrestrial standards at first glance. In the coming weeks, ChemCam researchers will pore over the data to look for tiny variations among the peaks and valleys within spectral data captured on Earth and on Mars. These comparisons will allow the team to fine tune and calibrate the instrument, ensuring that every spectral signature gathered by the rover is accurate. Each element on the Periodic Table has a unique spectral signature. 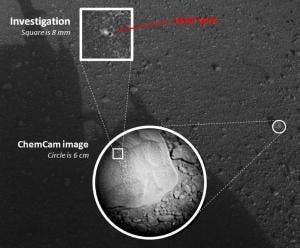 ChemCam scientists will be able to use these spectral fingerprints to decipher the composition of Martian geology, including information about whether Mars rocks ever existed in a watery environment or underwent changes due to interactions with biological organisms. With regard to Coronation rock (the rock formerly known as N-165), ChemCam's inaugural target, "at first glance it appears consistent with a basaltic composition," Wiens said. "What's more interesting, however, is whether the rock had dust on it or some other kind of surface coating," he said. "ChemCam saw peaks of hydrogen and magnesium during the first shots that we didn't see in subsequent firings. This could mean the rock surface was coated with dust or some other material." "After Coronation, we got to shoot at a group of ugly-looking rocks in the area named 'Goulburn,'" Wiens said. 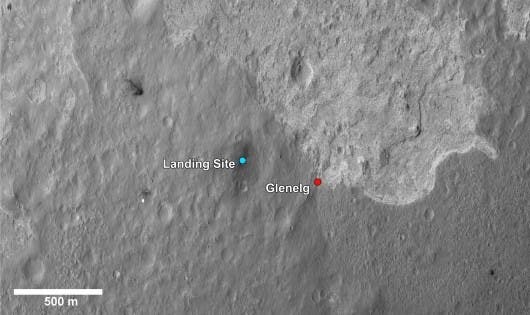 "That is one of the areas near the rover that was blasted by the thrusters of the landing vehicle, but these rocks were much farther away from the rover than Coronation, providing a bit more of a test for the ChemCam's laser." The ChemCam system is one of 10 instruments mounted on the MSL mission's Curiosity rover—a six-wheeled mobile laboratory that will roam more than 12 miles of the planet's surface during the course of one Martian year (98 Earth weeks). The system is designed to capture as many as 14,000 observations throughout the mission. "We are just jubilant," Wiens said. "This mission is absolutely amazing. Everything is working so well. The same applies to our instrument."